An international team of astronomers from France, Italy, the UK and Australia has found a previously unknown galaxy colliding with our own Milky Way. This newly-discovered galaxy takes the record for the nearest galaxy to the centre of the Milky Way. Called the Canis Major dwarf galaxy after the constellation in which it lies, it is about 25000 light years away from thesolar system and 42000 light years from the centre of the Milky Way. This is closer than the Sagittarius dwarf galaxy, discovered in 1994, which is also colliding with the Milky Way. The discovery shows that the Milky Way is building up its own disk by absorbing small satellite galaxies. The research is to be published in the Monthly Notices of the Royal Astronomical Society within the next few weeks. The discovery of the Canis Major dwarf was made possible by a recent survey of the sky in infrared light (the Two-Micron All Sky Survey or "2MASS"), which has allowed astronomers to look beyond the clouds of dust in the disk of the Milky Way. Until now, the dwarf galaxy lay undetected behind the dense disk. "It's like putting on infrared night-vision goggles," says team-member Dr Rodrigo Ibata of Strasbourg Observatory. 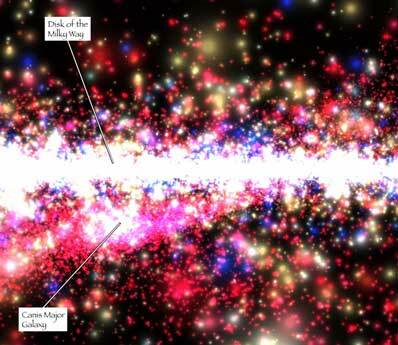 "We are now able to study a part of the Milky Way that has been previously out of sight". The new dwarf galaxy was detected by its M-giant stars -- cool, red stars that shine especially brightly in infrared light. "We have used these rare M-giant stars as beacons to trace out the shape and location of the new galaxy because its numerous other stars are too faint for us to see," explains Nicolas Martin, also of Strasbourg Observatory. "They are particularly useful stars as we can measure their distances, and so map out the three-dimensional structure of distant regions of the Milky Way disk." In this way, the astronomers found the main dismembered corpse of the dwarf galaxy in Canis Major and long trails of stars leading back to it. 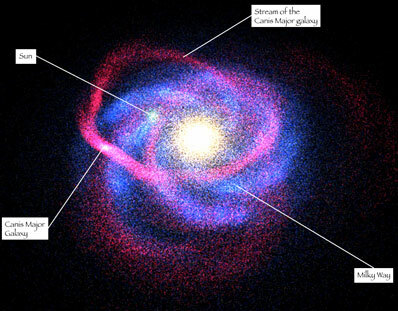 It seems that streams of stars pulled out of the cannibalised Canis Major galaxy not only contribute to the outer reaches of the Milky Way's disk, but may also pass close to the Sun. Astronomers currently believe that large galaxies like the Milky Way grew to their present majestic proportions by consuming their smaller galactic neighbours. They have found that cannibalised galaxies add stars to the vast haloes around large galaxies. However, until now, they did not appreciate that even the disks of galaxies can grow in this fashion. Computer simulations show that the Milky Way has been taking stars from the Canis Major dwarf and adding them to its own disk - and will continue to do so. "On galactic scales, the Canis Major dwarf galaxy is a lightweight of about only one billion Suns," said Dr. Michele Bellazzini of Bologna Observatory. "This small galaxy is unlikely to hold together much longer. It is being pushed and pulled by the colossal gravity of our Milky Way, which has been progressively stealing its stars and pulling it apart." Some remnants of the Canis Major dwarf form a ring around the disk of the Milky Way. "The Canis Major dwarf galaxy may have added up to 1% more mass to our Galaxy," said Dr Geraint Lewis of the University of Sydney. "This is also an important discovery because it highlights that the Milky Way is not in its middle age - it is still forming." "Past interactions of the sort we are seeing here could be responsible for some of the exquisite detail we see today in the structure of the Galaxy," says Dr Michael Irwin of the University of Cambridge.